that exists in the ocean, and, therefore, we have salt in our blood, in our sweat, in our tears. We are tied to the ocean. Hello. I'm a writer/photographer who writes about and photographs all things nautical. 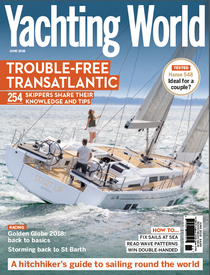 As well as contributing articles to a range of magazines, I write books about boats, sailors and the sea (plus the occasional foray into economics). I have a large archive of photos, mainly of sailing boats, and I'm regularly out on new assignments. There's more info in About Me, and details of recent books below. You can read my (very) occasional Goodreads blog here. Photo above by Sam Compton. They say the sea always finds the inner you. Slowly, relentlessly, it washes away the veneer of politeness and reveals people’s true nature. And it’s not always pretty. Take Paul Terman, an experienced German sailor who set off on a transatlantic cruise in 1981 and felt so antagonised he ended up killing the yacht’s skipper and his girlfriend. Or Donald Crowhurst, who spent months drifting around the Atlantic pretending to be sailing around the world in the 1968 Golden Globe race before giving up and committing suicide. Even during the Age of Discovery, there were several mutinies and mass murders caused by spending too long at sea. And mental illness was so widespread during the Age of Sail that the Royal Navy was forced to build several ‘asylums’ to house its mad sailors. It’s a rich area for psychologists too, and several case studies have been made of long-distance yacht races as well as more general studies of the ‘outlaw sea’, where national laws don’t apply. The philosopher Foulcault describes ships as “not only the greatest instrument of economic development […] but the greatest reservoir of imagination.” And it’s a thin line between the imagination and the fantastical; reason and madness. This book looks at the sea’s physical character, how it confuses our senses and makes rational thought difficult. It looks at the long history of madness at sea and how that is played out in many of today’s singlehanded and crewed races. It looks at the often marginal behaviour of sailors living in a liminal space which is both figuratively and literally outside society’s usual rules. And it looks at the sea’s power to heal, as well as cause, madness. Published by Adlard Coles, September 2017. Available here. It's also available as an audiobook, narrated by Dugald Bruce-Lockhart, at Audible. 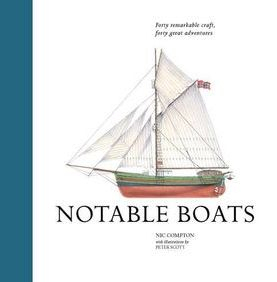 It's exactly what it says on the tin: a collection of 40 stories of 40 interesting or 'notable' boats. It took some ingenuity to think of interesting stories for some of the boats suggested by the publisher, eg a gondola (Casanova's escape from the Doge prison), a Hinckley sloop (John Lennon's trip to Bermuda shortly before he died), etc. Lots of the usual suspects are there (Spray, Suhaili, Dorade, Gypsy Moth IV, etc) as well as a few surprises (who's heard of Evgeny Gvozdev, Amyr Klink and Kawika Kapahulehua?). I even managed to squeeze in Huck's raft and the Kon-Tiki. Anyway, I'm very pleased with the end result: one of those books that it's a pleasure to hold (regardless of what's inside!). Like most sailors who have navigated through UK waters, I've often been at the receiving end of the Shipping Forecast and been grateful for its reliable predictions. I've also sat at home and been entranced by its strangely poetic rhythms, as it circles around the 31 sea areas, from Viking down to FitzRoy and back up to Southeast Iceland. So I was delighted when BBC Books asked me to write a miscellany based around this most unlikely of national institutions. 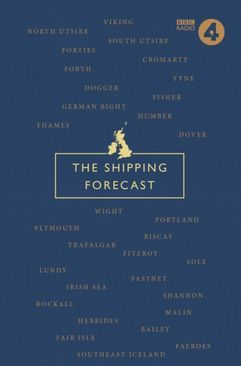 The result is this book, which starts off with a description of how the Shipping Forecast came to be adored by seafarers and landlubbers alike, before dipping into each of the sea areas themselves to explore some of the rich maritime culture to be found around the British Isles. Featured on: the Today Programme (BBC Radio 4), the Steve Wright Show (BBC Radio 2), the Breakfast Show (BBC 1), BBC Radio Devon, The Telegraph, The Daily Mail, The Express, The Times and Radio Times. 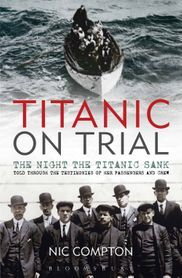 I can't pretend I had any interest in the Titanic before I was asked to write this book. But I soon got interested, trawling through thousands of pages of first-hand testimonies about the disaster. I think what makes it so compelling as a story are the hundreds of interlocking stories of human suffering, courage and fallibility – as well as plain cowardice and selfishness. And there are bigger themes of man vs nature, corporate greed, institutional failure, etc. It really is all there! My book tells the story in 'real time' from the perspective of various passengers and crew – from the firestokers standing in the engine room when the first gush of water bursts through the hull, to the first class passengers who may or may not have paid their way to safety – all told in their own words (lightly edited). It was certainly one of the most engrossing assignments I've ever had, and I now count myself among the millions of Titanoraks out there. Published by Bloomsbury, April 2012. 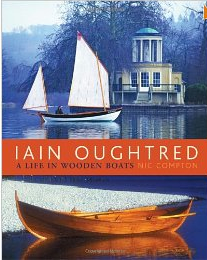 This was my first attempt at writing a biography and, while I would probably do things differently now, I think it's a good attempt to capture one of the most enigmatic characters in the boating scene. One of the first designers to see the potential of epoxy/ply construction, Iain made his name with elegant boats designed for amateur construction, never patronising his customers, and proving that amateurs could build beautiful boats too. Designs such as the Acorn Skiff, the Caledonian Yawl, the Ness Yawl and, more recently, the St Ayles Skiff have helped establish a worldwide following for the reclusive designer. Published by Adlard Coles, 2009. Did Nelson really say 'Kiss me Hardy'? Ever wondered why boats are always referred to as 'she'? Or why a rope on a ship is rarely called a rope? Or where the highest tides and fastest currents in the world are? And did Britain's greatest naval hero really ask another man to kiss him before he died? 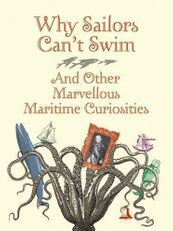 Why Sailors Can't Swim is awash with maritime folklore, trivia and anecdotes for sailors and non-sailors alike. 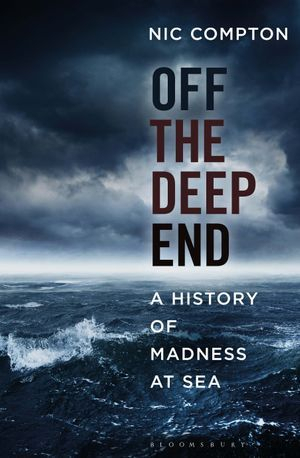 As the blurb says, it's "full of entertaining, surprising and insightful titbits about the history, science and culture of the sea. [...] Learn the origins of the myriad of nautical expressions that have crept into everyday English speech, and impress with your knowledge of bizarre and obscure nautical facts!" Published by Adlard Coles, May 2013. We didn't really know what we were getting when we bought our 1990s fibreglass Victoria 26 from a barn in Basingstoke. 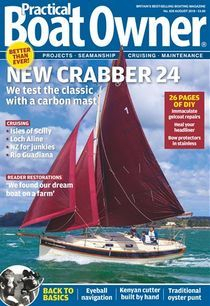 My latest article for PBO describes the highs and lows of doing up an old boat – in just 4 weeks. My first job was skippering a Crabber 24 in Greece back in the 1970s, so I was interested to see how the design has evolved over the past 40 years. 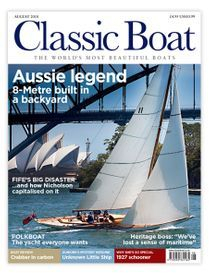 Read about how the new design by Andrew Wolstenholme brings a much-loved classic firmly into the 21st century in the August issue of Classic Boat. Malcolm Darch's models often take longer to build than a full-size boat and are rightly regarded as investment opportunities. 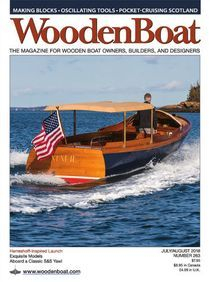 Meet a miniaturist at work in the July/Aug issue of WoodenBoat. Everyone loves Susie Goodall, as shown by the massive send-off she received at the start of this year's Golden Globe Race. 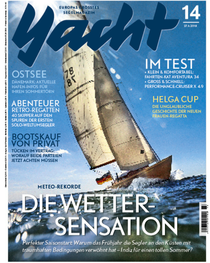 You can read about what makes her tick (and what terrifies her) in the June issue of Yachting World. According to Google, that translates as 'Nice British Boat' – and the new Crabber 24 is certainly all of that. 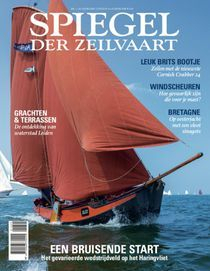 The iconic British brand has a devoted following in Holland, where the return to a more shallow-draughted hull shape will no doubt find favour. Susie Goodall is the youngest entry and the only women in this year's Golden Globe Race. I interviewed her in Falmouth as she was preparing her boat to sail around the world. The story of the British sailor Donald Crowhurst, who pretended to be sailing around the world before going mad and committing suicide, has inspired books, poems, movies, plays and even an opera. With the 50th anniversary of the race coming up, a new movie has been released starring Colin Firth and Rachel Weisz. 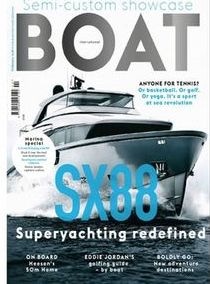 You can read my review on my Goodreads blog, and get the full story in the March issue of Yachting World. 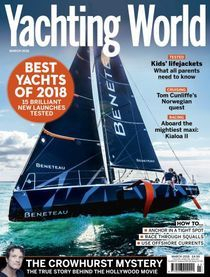 I'm not generally a great fan of superyachts, but Boat International did me proud with a very nice treatment of my article on the healing effects of the sea – a panacea to my book about madness at sea. And if the message reaches out to some rather well-heeled people on fancy yachts, then it can only be for the good.